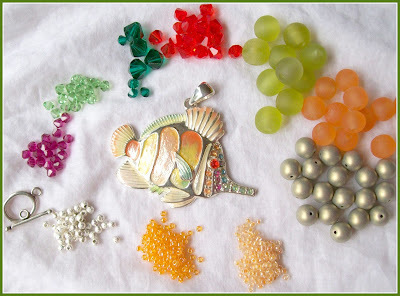 Amybeads: Bead Soup Blog Party - REVEAL! First off, I would like to thank Lori Anderson, for hosting this very fun event - and for pairing me with a terrific partner. Next I want to thank my Bead Soup partner - Alison at BeadsByEarthTones, for such a beautiful bead soup! 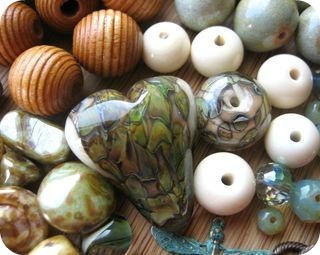 While I typically select brighter colors for my beading, I am a nature lover at heart, and these beads really spoke to me. I immediately honed in on the handmade focal and matching clay pieces from Alison's Organics collection. 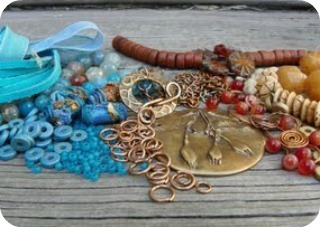 I also had some blue died wooden beads and some copper colored fire polished beads to complement. 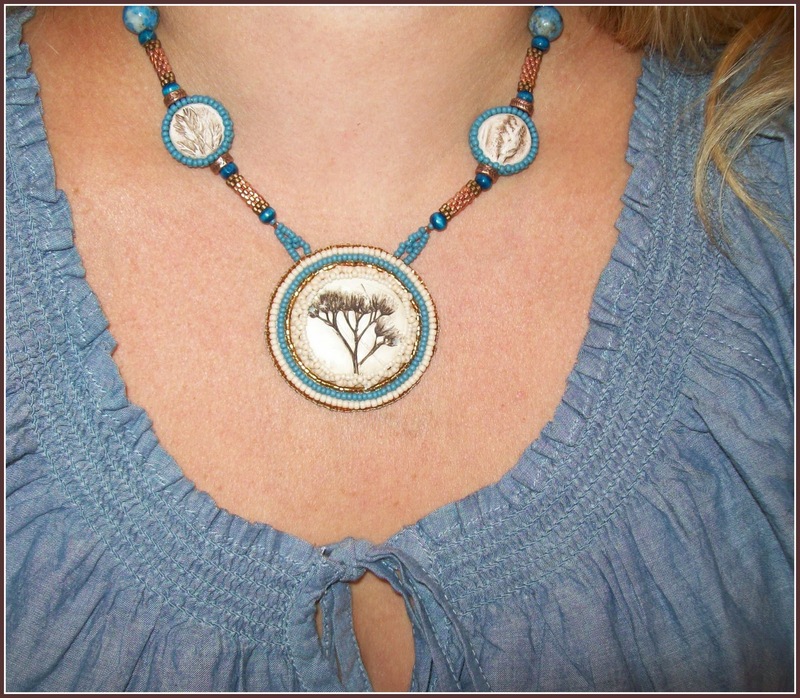 I bezeled the smaller clay pieces with denim seed beads in a right angle weave bezel...and for the focal I embroidered around the focal and did a small netted bezel. Usually - I buy clothes and then make something to go with them....this time I bought a shirt to go with the piece I made! But alas - I still had many beautiful beads left from Alison's awesome soup! I especially loved the dark carved wood bead and wanted to be sure to highlight that. As I began going through my stash I came across some very old beads. After a bit of culling the cracked seeds, I put them together with some round jade stones for my second BSBP piece! I also had some blond colored wooden beads I added to this piece. This was a spectacular BSBP experience for me. My husband even commented on "how much fun" I was having with it and noted my excitement for the reveal. 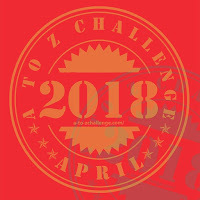 I plan to visit all the participants' blogs, no matter how long it takes. I hope everyone had as much fun as I did!! Here is the soup I sent Alison and I can't wait to see what she did with it! And finally - here is a list of all the participants - happy blog visiting! 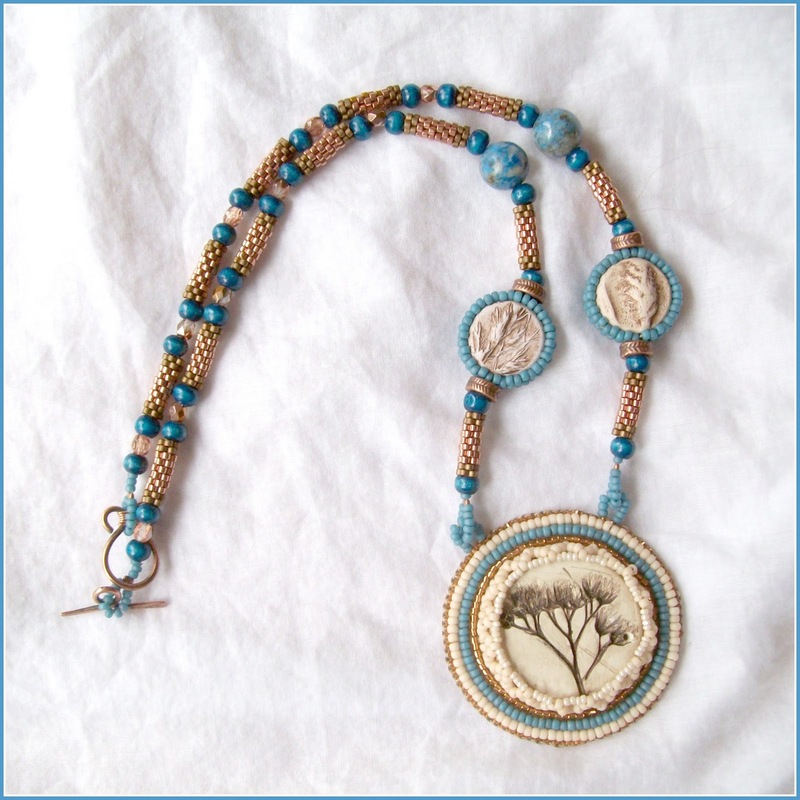 I love the blues in the pendant and what lovely beads you had to work with. Both necklaces are nice but the first one really speaks to me!!! Love the shirt you bought to go with it. I’ve been so excited about the bead soup party and now it’s time to make my rounds! OOh i really love what you've done to your bead soup! I especially love the bead woven one! Amazing work! I love how you have set the focals - such a lot of work! My personal favourite though is the second piece as I just love the wire pendant and the mix of woods. Oh my! Those are two fantastic, and very different, creations you have there! The first necklace took my breath away - I wasn't expecting all that detailed beadwork. And bravo for truly delving into your bead stash and making that second piece work! Gorgeous pieces! I love the first one you created, love those cream colors and blues and coppers. I also think the second one is fabulous -love the browns and greens and that focal weave pendant is awesome! Stunning pieces! Oooooh Lovely stuff but that top necklace is just divine!!!! Gorgeous! what great earth and sky going on with the one you did the beadweaving on. seeing it on you makes the understated colors pop to life. I like it very much! Thank's! Wow, both pieces are lovely, but that first one has to be my favorite. I love how you showcased the focal with a beaded edge without hiding its beauty. Your work is exquisite! Marvelous, Breathtaking...can't say enough! 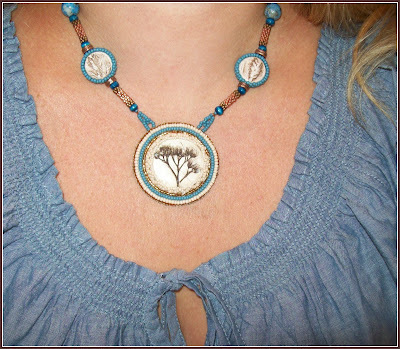 What beautiful beadwork I love the tree focal and the blue compliments it so well! That first necklace is GORGEOUS !! WOW I so admire what it takes to work with those little beads, gorgeous result!!! Well, I must say that both pieces are gorgeous. Beautiful seed bead work, and what lovely designs! Perfect for fall, and I love both of them! Love the way you used the seed beads with your soup mix, you've really put everything together beautifully. Wow! What lovely work. I am a true fan of bead embroidery, well done! You bead soup was definitely a lot of fun. The neutrals left you open to a lot of color choices. Both necklaces are just great. Your beadwork is stunning! since I am a off-loom beadweaver myself I love what you did with the first piece and it looks so nice on. It is so calming and I love the greenish tone of the second piece and how wonderful that you "found" the pod beads in your stash that seemed to be just waiting for this creation. Great work. absolutely stunning beadwork!!! I love the first one!! Beautiful!!! Wow, so different from your usual color scheme, and yet you really pulled it off! Great job. Nice Amy! The first one you made is really stunning. Love the organic feel of the focals and your seed bead work sets them off great! What a beautiful job you did, Amy! I love (and would wear) both of these pieces. Way to go!!! Lovely! Both turned out great. I especially love the serenity in the first one. I wish I could just whip up some beads like you did to make that first piece! It is outstanding. AMY! You did an AMAZING job!!! 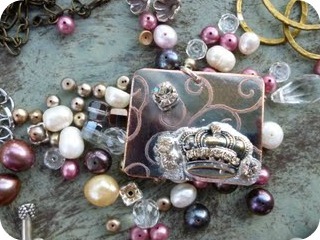 It makes me happy to know my beads are in such talented hands...your designs take my breath away! Thank you for being my partner and thank you for taking my palette to a new realm! I love both of them, your designs are awesome! Gorgeous pieces! I love the colors you used. Wonderful pieces, you did a great job! Fabulous! I love the first piece as it has a Native American feel to it. You do wonderful work! Wow! Great work! 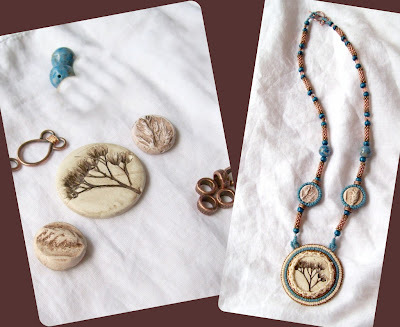 I love that carved wood bead and how you used it. Lovely necklaces! I really like the bead embroidery one, lovely with the netted bezel! Amy, I loved the whole look of the first one so much, I was just full! Then you had to go offer the second one! And in a totally different way, it was just as awesome as the first! Way to go girl!!! Great beading to create bezels for the wonder focal beads. Also, the second piece using the natural seeds is just great. Wow! Stunning work! I have such respect for people like you who excel with seed beads and stitching....not a technique I am drawn to at all, but the effect is just wonderful when in capable hands! Beautiful work! Your work is beautiful! I love what you cooked up and that focal is stunning. Excellent bead work! Love the focal bead too...all of the beads are amazing! wow!!! The detail and colors in that first necklace is absolutely gorgeous! and I LOVE all the earthy tones and style of the other pieces too. Great job! Wonderful! You have created two terrific pieces of wearable art. I like your use of color and texture and the great fall colors in the second necklace. Thank you for sharing your artistic process with us. Cheers! What gorgeous creations, I never would have thought seed beads would go with the kind of bead soup sent to you - but you made it work! I love on the combination of colors, turquoise with ivory/cream. But that other necklace is quite marvelous too, what a sweet rediscovery of those actual "seed" beads! And, om nom, jade. I do love jade. Always and ever. Nothing can go wrong with it. Fabulous soup from Alison and oh, what you've done with it! I love both of your designs - I was drooling over your first necklace, and then scrolled down to the second - a wonderful mix of muted greens and browns that you've blended perfectly with the woven focal. Gorgeous work! I gasped with delight when I saw what you created with your soup. What treasures! I am in awe of that first necklace. Just gorgeous! Lovely necklaces! The bead work on your first necklace is stunning!! Beautiful necklaces! Loved that you beaded around the focal bead in your first creation...awesome work! You did an awesome job on both them! 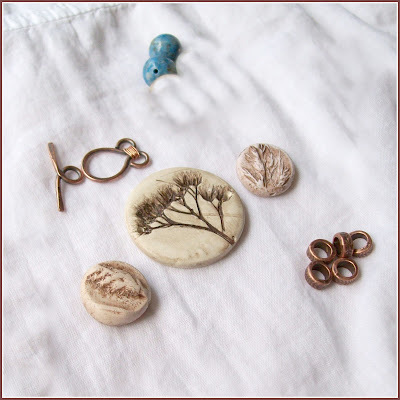 I love everything but being a bead embroidery kind of gal I especially love the first one. Beautiful! Wow, both pieces are lovely! Lovely creations!! Especially the nature necklace! I love what you did! I think you'll enjoy wearing your pieces! I so impressed with your work! Very, very beautiful! I love both pieces. And your seed bead work is awesome. It really sets off the focal and the matching beads. But the 2nd piece really speaks to me. Maybe because I too got some seed beads from Peru a couple of years ago when I went. But I gave them to my DIL and didn't keep any for myself. :( I know she'll share if I ask though. :) Wonderful job. Very Beautiful and unique necklaces Amy. 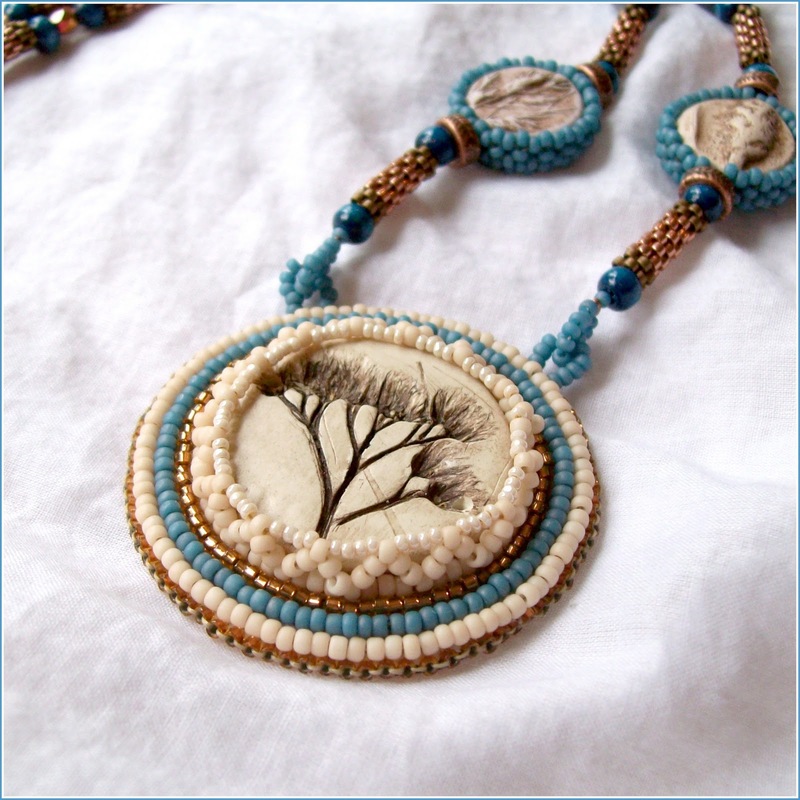 Your first necklace with the beaded beads and the bezeled ceramic beads and pendant is gorgeous. I love the fact that you used the real seed beads in your second necklace and they are the perfect match with the jade beads, wooden beads, and the wired pendant. I love both the different looks..but your seed bead piece is really special , gorgeous colours. Love the pairing of the green and real seeds and the wire focal element is fab..love it. Wonderful work. Love them both. really beautiful!! The first one is so soft and wonderful - really special. The second one is great too. I love both but the first one... hmmm.. sooooo lovely! Very impressive! 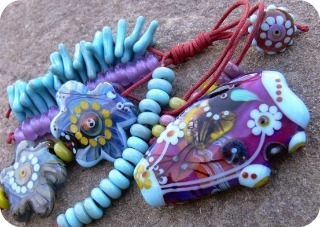 That's amazing what you did with that clay focal & matching beads! Both finished pieces turned out beautiful & have a very unique and artsy quality. I am in awe of your seed bead work ! Gorgeous pieces! Beautiful seed bead work! I wish I had the patience for it. I am loving the Bead Soup Blog Party. Seeing all the different creations is quite amazing. Love your focal with the beadwork, but then I am an unrepentant seed bead lover and hoarder. Both of the pieces that you made are beautiful! I love your bead work on the first piece. Gorgeous! Beautifully done, the beadwork sets off the focals so nicely. Beautiful soup! Love the beadwork around the focal. I've always wanted to learn that technique. Maybe someday! I really,truly,dearly love, did I say love, love,love your first piece!! 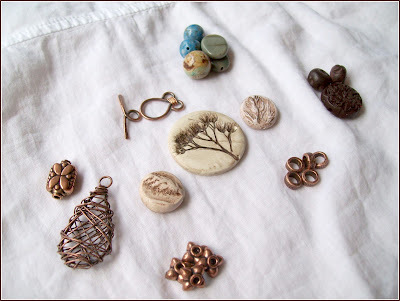 Love the rustic beads you got and the colors you chose to encase them in with your wonderful beading. If you decide to sell that piece please contact me first!!! What a clever twist on the beads you were given. You totally breathed even more life into them. Well done - really beautiful! Beautiful beadwork on your necklace! Great job! As a fellow seed beady gal, I like what you did with the handmade beads - great ornamentation without overwhelming their delicacy. And the second necklace is pretty darned fabulous too. This was fun, wasn't it? Wow what a beautiful pc youve made! I love love your beadwork! This shows so much effort and is one lovely creation! Great Soup!! I love what you did with Allison's beads! I think the contrast between your style and hers is a great example of what the BSBP is all about. I especially like your second BS project.. Love the green, wood and wire piece together. Incredible artistry! Love how you beaded the focals in that first necklcae, simply amazing! You so captured my heart with that first piece! I am totally in love with it! What a remarkable beader and sweetheart you are!!!! I loved the things you created. I didn't do the soup. Hopefully I will do one someday. I must confess that I am not into beaded necklaces, but I do LOVE your bead work in the first necklace!!! This is amazing! Both pieces are stunners. Seriously. Just wow! Amazing beadwork and a lovely design. 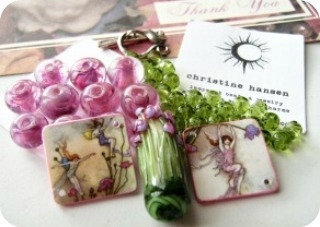 Really beautiful pieces...those bead tubes are the perfect compliment to the beads you recieved. And I love what you did with the focal. I love both of your designs. I really admire your seed bead work. I don't seem to have the patience for that, not to speak of the eyesight. What a beautiful job you did with the seed bead work. I am in awe of people who can work with seed beads as well as you. 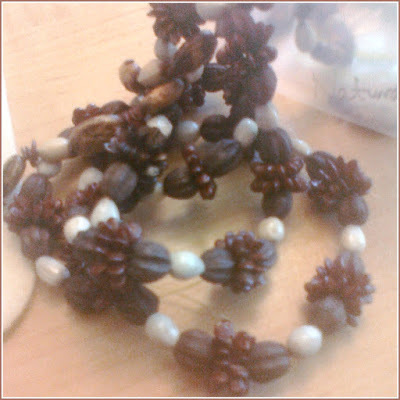 And, OMG, I have a necklace made of real seeds too. I have often thought about taking it apart and now that I see what can be done, think I will tackle it in the next several months. omg >.< Both pieces are absolutely stunning! I can't stitch or bezel to save my hide so I am in awe of those who can, but both of these are just ... I just flippin' love them! OMG!!! Those beaded beads are just gorgeous fantastic soup! That first necklace is stunning! Such patience with tiny beads...something I lack! Lol! Beautiful! Amy - oh wow, what beautiful pieces you've made! I love how you pulled out the old stash and it worked so perfectly with the new stash! Way to go, girl! I'm in love with the first one but both are wonderful! Great job! You did an amazing job setting off those beautiful organic beads!! the denim colors and your beaded peyote tubes are perfect for it!! LOVE IT!!!!!! I can't decide which piece I like more- lovely colors and design! Beautiful work! Wow! What a pretty necklace. It looks great on you. Both pieces are great looking. We (Andrea & Julie) are both huge fans of the bead weaving, and you did such an outstanding job!! We especially love the beaded bezel around that gorgeous pendant. Love both pieces! Bravo! The first necklace is my favorite! Stunning! Stunning! 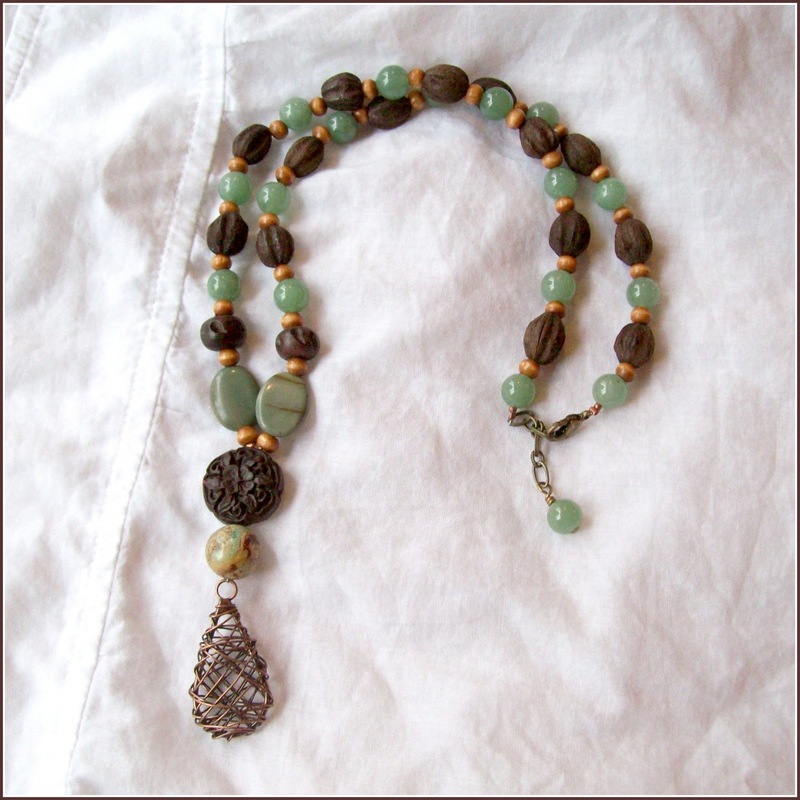 Love the peyote tubes, and the copper really draws attention to the dark tones in the focal bead. And the second piece as well! So lovely, organic and woodsy. Gorgeous work! Your bead embroidery is wonderful! I wish I had the patience to do that! Awesome bead soup, your bead work is incredible. Your first piece just stopped me in my tracks. It is truly beautiful, the way you highlighted the pendant with the seed beads is just gorgeous. beautiful colours, shapes - really great job! I love the bead work you did. Wonderful! SO BEAUTIFUL! Your designs are amazing! Beautiful! And it really suits you too. Really love your necklaces, that first one is some amazing beadwork! That first necklace is amazing! Really beautiful - love those clay pieces and they way you created with it - they way it wears - it just feels special - like it might tell a story! And that focal on the second piece - awesome!! Wow, two great but totally different pieces. You received wonderful focals in your beadsoup and did such a great job using them. I loved the beaded one.... but then you showed us the strung one.... I love it. And I love how you came by those beads... wonderful story! Both of your pieces are lovely. Love your bead embroidery and bead weaving. Great job. Wow, both your necklaces are gorgeous. You did a great job, each one so different and both so beautiful. I love your beadwoven piece - I am just a sucker for weaving!! your work is just breath taking!! 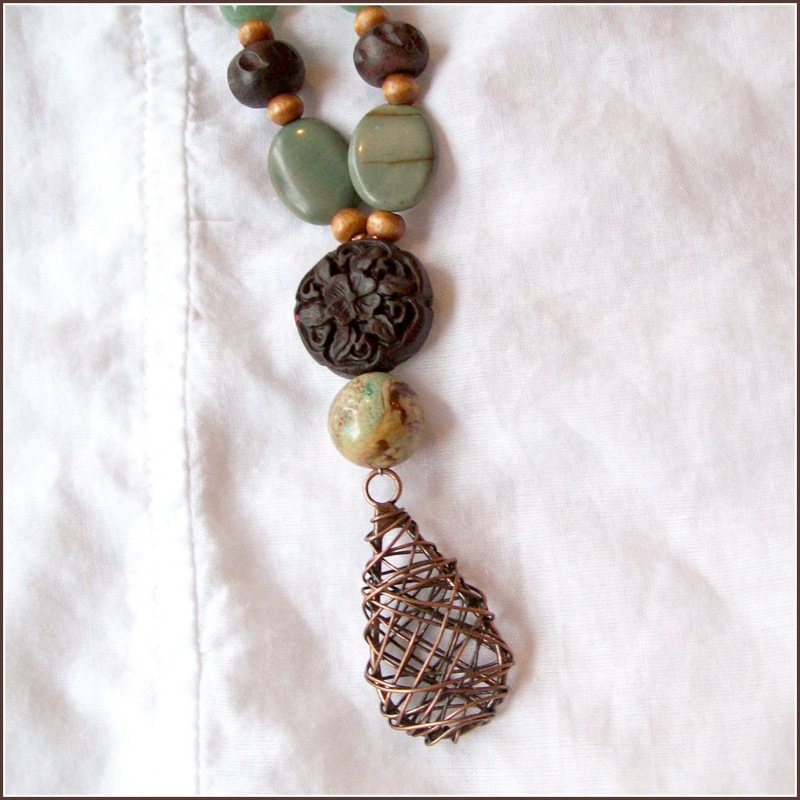 love the first pendant-love that you kept with the organic feel of the clay beads!! Oh, how pretty that pendant is! I love what you did with it. It looks made for a blue jean day! Love the colors and and your bead work! I cannot believe how many pieces you were able to create from your soup. I must say that I am in awe of your ability to work with seed beads. WOW! You created amazing jewelry! I am not a seed beader and am in awe! Great job! I like the jewelry you made. The necklace with blue is just pretty. I like you style really. Amy I love what you did with your soup! Glad you showed the first piece on you with your new shirt... looks great! Those seeds sounded fun to work with too. Fun is the best part of this! Love the bezel! So cool! And that second necklace is just stunning! I like how you incorporated the focal bead in your style, but I must confess that I prefer the second piece. OH your pieces have taken my breath away. What a lovely combination of beadweaving and color on the first. You complimented the focal so beautifully. I love the second as well, drawing the eye to the wonderful wire wrapped pendant! Beautiful! Both of them are terrific! Seed beaders never fail to amaze me! Love them both! Beautiful beads and your bead work is just amazing! You did a Soup-er job with your soup mix! Beautiful necklaces! 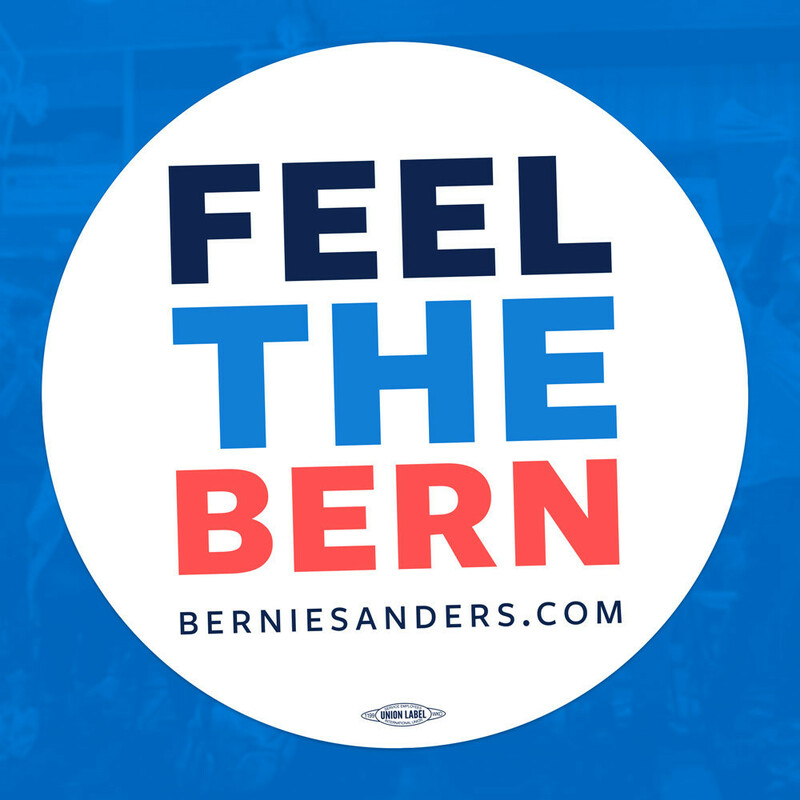 I really like the colours and design of the second one, but I love the first one. The design/style is great and you've framed the pendant so well. Fab job! Love the necklaces! I also love that you bought a shirt to match the necklace, I've done that before! Amy - I love what you did with your Bead Soup - but had to giggle at "so I whipped up some peyote beaded tubes" - as I write this, I'm still giggling...you talk about "whipping up peyote stitch" like I talk about whipping up a pot of oatmeal, lolol. And those REAL SEED beads - that was an inspired addition if you ask me. p.s. 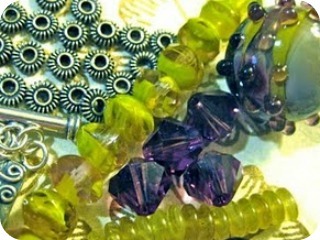 don't feel bad about having beads in your stash for years and years - they don't go bad, lol. WOW WOW. Your pieces turned out beautiful. I just LOVE LOVE LOVE the first one. And the kit you sent looks like so much fun! can't wait to go see what your partner made.